We might be a little biased but we think we have the best bosses ever! Today has traditionally been a day for employees to thank their bosses for being kind and fair throughout the year, but here at Elite we like to go above and beyond! Carla and Joanna are two of the hardest working women I’ve ever met. They both have different leadership and management styles but I think that is what makes Elite run so well. They each take the time to get to know us as individuals and see where we thrive and where we could use some help. They help with everything from scheduling elderly care cases to staffing Certified Nursing Assistant shifts. Carla can be found right when you walk in the door, greeting you with a smile and a “tell me something good”. Joanna might be tucked in the back but she’s always hustling to finish payroll or helping us staff shifts for our CNAs, LPNs, and RNs. If you ask any of us here at Elite what we think about Joanna and Carla the answer would be the same across the board…We love them and don’t know what we would do without them! 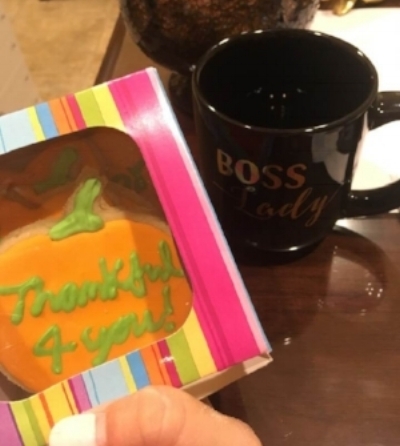 We surprised Joanna with cookies and a cute Boss Lady mug. Unfortunately, Carla is out of town on vacation but I’m sure there will be a present waiting for her when she gets back!